Science fiction fans know who the “Big Three” are – Robert Heinlein, Arthur Clarke, and Isaac Asimov, who have all changed the way science fiction is written. Without a doubt, Isaac Asimov has made a mark in the world of literature that cannot be surpassed by other science fiction writers. Asimov penned 500 books and 90,000 letters and postcards. He also went by the pen name Paul French for some of his works. Beyond his artistry, awards, and contribution to the world of literature and science, one cannot help but wonder – where did he get all of these ideas of humans invading planets, the Earth becoming radioactive, robots wanting to become humans, a lonely wife falling in love with a robot? Reading a work by Asimov is time traveling far, far into the future. Take note that his broad list of original works were created when the world wasn’t flat yet. He couldn’t just log into Pinterest and search for inspiration. Everything just popped out and turned into one whole galaxy. Take “Bicentennial Man” for example. It was written in 1976 and was set in 2005. Unfortunately, we still don’t have our own Andrew Martins in the real world. 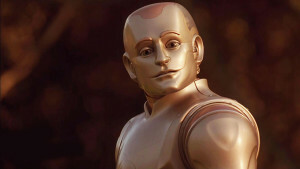 Still, how can a man’s brain come up a story as complicated as “Bicentennial Man”? To find out how he was able to transcend trends and think ahead of the times, one must see how his life played out. 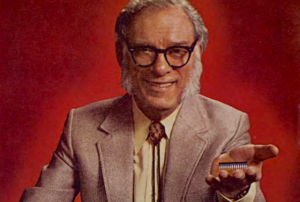 Get to know Isaac Asimov, the time traveler. On January 2, 1920, Isaac Asimov was born in Petrovichi, Russia to Anna Rachel and Judah Asimov – both are Jewish millers. His name in Russian is Isaak Ozimov and was later known as Ayzek Asimov, a Russian Cyrillic adaptation of his name’s American English pronunciation. Asimov wasn’t an only child. He was the eldest of three with his sister, Maricia, being the middle child and his brother, Stanley, being the youngest. Stanley was the vice-president of New York Newsday. Though Russian, he never spoke the language or experienced the culture. His family relocated to the United States, so he grew up in Brooklyn, New York. Learning English wasn’t a big deal for him since his parents always spoke Yiddish and English with him. At an early age, it was already evident how Asimov learned fast, even without adult supervision. He learned how to read on his own at the age of five, and he entered first grade a year early though it wasn’t because of his smarts. His mother claimed that he was born on September 7, 1919. His parents were educated as Orthodox Jews but did not practice the culture. They also did not bother to teach their children their ways. Instead, they grew their wealth through their candy stores. The candy stores sold newspapers and magazines, which Asimov noted as the things that influenced his love for reading and writing. He finally became an official United States citizen in 1928. Asimov has been a fan of science fiction pulp magazines since he was young. As a matter of fact, his father forbade him from reading the pulps, since he thought that they were just a waste of time. The only way Asimov was able to convince his father to let him read the pulps was because it had “Science” in its title and thus, according to Asimov, the pulp magazines were educational. Asimov began his science fiction career at the age of 11 when he started testing his original stories. By the age of 19, he began sending his stories to science fiction magazines. The editor of Astounding Science Fiction back then, John Campbell, was a formative influence on Asimov. He eventually became one of his friends. Asimov graduated at the age of 15 from the Boys High School in Brooklyn. He went on to Seth Low Junior College, which accepted Jewish and Italian-American students. He was originally a zoology major then he moved to chemistry as he did not want to dissect cats. He finished his studies at University Extension – later known as Columbia University School of General Studies – in 1939. During World War II, he was drafted into the U.S. Army, but only because he changed his birthday. If he had not, he would have been 26 years old and ineligible. After nine months of service, he received an honorable discharge. During his short military career, he went up the corporal rank because he was a fast typist. He was able to avoid the 1946 atomic bomb when he was removed from the task force days before sailed to Bikini Atoll due to a bureaucratic mix-up. Asimov started his teaching career at the Boston University School of Medicine wherein he worked as an associate professor. He decided to pursue his writing career full-time in 1958 though he still kept his title as an assistant professor. The university eventually honored his works by giving him the full professor title. 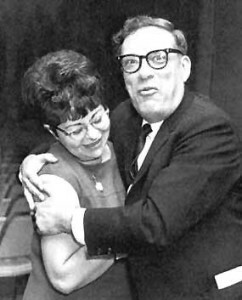 Asimov’s first wife was Gertrude Blugerman. They lived in an apartment in West Philadelphia, and then they moved to Boston, and then settled in West Newton, Massachusetts in 1956. They had two children – David and Robyn Joan. In 1970, Asimov moved to New York where he passed away. He married his second wife, Janet Jeppson, just two weeks after his divorce with his first wife. Asimov was known to be a very approachable and patient public speaker who would answer thousands of questions in conferences. He would even reply to mail and postcards. He loved signing autographs. 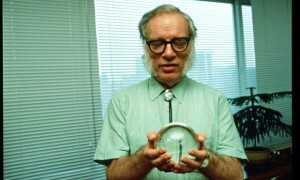 The American Humanist Association (AHA) named Asimov Humanist of the Year in 1984. He signed the Humanist Manifesto and led the association as president from 1985 until his death in 1992. Star Trek fans would know its creator, Gene Roddenberry. 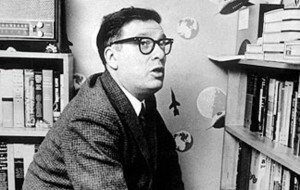 Asimov was a close friend of Roddenberry and was credited in the film as Special Science Consultant. Asimov was aware of his abilities, but he was also keen to praise those who have impressed him. He talked about Carl Sagan and Marvin Minsky, the only two people whom he think have surpassed his intellect. Asimov died on April 6, 1992, but as early as 1977, he already suffered a heart attack. He had triple bypass surgery in 1983. When he passed away, his brother Stanley reported that his death was due to heart and kidney failure. Ten years after Asimov’s death, Janet Asimov published her edition of Asimov’s autobiography. In the book, It’s Been a Good Life, she revealed that the complications that caused his death were due to HIV, which he got from a blood transfusion during one of his operations. The family decided not to publicize the details right after his death because of the public’s anti-AIDS prejudice. Asimov received a lot of awards during his lifetime for his literary work. Part of these awards are 14 honorary doctorate degrees from universities. They are as listed below. – Thomas Alva Edison Foundation Award, 1957 for “Building Blocks of the Universe. Yes, it’s a long list. And yes, it’s still growing even 23 years after his death. Past Asimov’s death, people still remember him. Some of his works were brought to the big screen – some successful, some a flop. But what kept the spirit of the inquisitive scientist alive was his love for the unknown. Through the movies and the continuous sharing of his works, even people of the 21st century started asking questions Asimov has been asking since the 1930’s. Is it possible for machines – robots – to become aware of their existence? Is it possible for them to become corrupted or to want to become human? Would they know ethics and morals? Would they look for a god? Can they overpower their laws? Do they have the freedom to choose? Can they display emotions? Is it possible for them to fall in love? Can they have hobbies that they would enjoy? Will they be able to feel pain? Populating Asimo’s writings were robots and huge things that anti-technology extremists or just plain skeptics were worried about. The same person who built and created the biggest starships across wouldn’t even step on a plane. It is also odd and fascinating for someone who built majestic flights and incomprehensive aero machines to be afraid of flying. In fact, he only flew twice in his life. He did not travel great distances. However, he found enjoyment going on cruise ships. Ironically, for someone who created vast worlds, Asimov enjoyed small spaces. He was a claustrophile at heart who wanted to own a magazine stand in a subway station so that he can listen to the rumbling train tracks. Despite gap between the writer and the fictional technologies he made himself, he loved his robots and gave them a chance to be heard. Through his works, both skeptics and pro-robot communities emerged. Evidently, this has been Asimov’s elemental drive. He gave technology and robotics a voice to his world and the world after him. His works continue to play a huge role in the advancement of technology, even after his death. He changed the course of the scientific world through his advanced way of looking at things. He was a game-changer of the industry.